I apologise for being so quiet on here the last few weeks. Things have been a bit stressful for one reason and another, and I haven’t really felt in the mood to craft or to work on either my blog or facebook page. To be honest at times I think I have been teetering on the edge of clinical depression (possibly pre-natal. Possibly just depression. I’m not really sure it makes a difference which). This isn’t something enough people openly talk about, but as a Clinical Psychologist, I see no shame in admitting that my mood can drop. Accepting ourselves, including admitting that there are times when we struggle, is something I encourage all my patients to do, and I would be a hypocrite if I didn’t apply the same to myself. As my father reminds me often, working in mental health doesn’t really make you any better at coping with life’s difficulties. What it has meant is that I have a little insight into what’s going on for me, and a bit of an insight into what I need to do to get myself out of it. Normally I spend a lot of time researching and sharing things for my blog and facebook page – I don’t benefit from it in monetary terms, but I do get pleasure when people share, like, comment or follow my pages. Unfortunately I have also found that I have been spending way too much time worrying when no-one clicks on the posts or people unlike the page. Focusing on this tiny amount of negativity and ignoring the positives has definitely contributed to my low mood. Combining it with external stress, has meant that my motivation to do anything for the page or blog has been pretty low and I just haven’t felt able to face it. 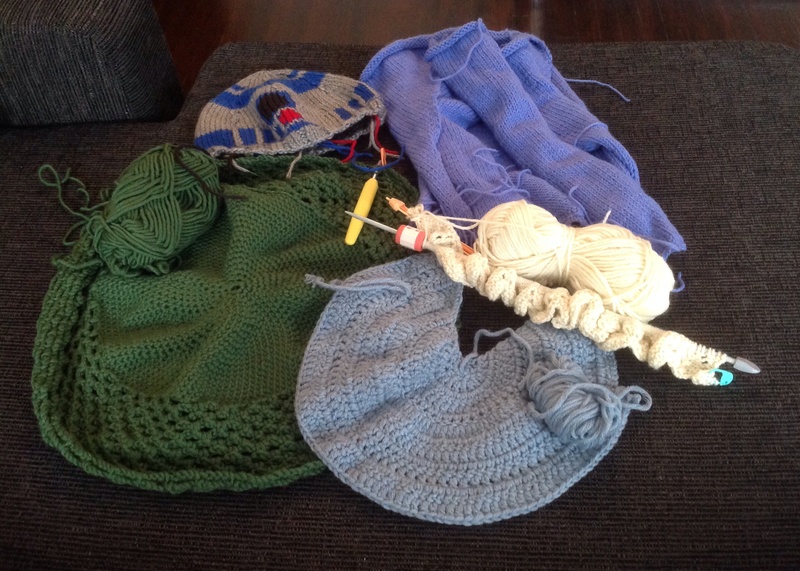 Even worse, I haven’t felt motivated to do any knitting or crochet either, and I have a bulging bag of unfinished projects that are crying out to be worked on. What I am only too aware of though, is that this is a slippery slope and can quickly become a vicious cycle: We avoid the things that give us pleasure as we have no motivation or energy to do them. But then we have more time to dwell on things that are difficult. And we don’t get some of the positive feelings from doing things that we are either good at or enjoy to help lift our mood. Which means we stay pretty unmotivated. And so it goes, round and round. I am also too aware of the potential impact that this is having on my 2 year old daughter. Whilst I don’t think it is a bad thing for children to learn that their parents can feel sad, having her regularly see me in floods of tears – seeing the worry on her face and her telling me “You’re ok mummy” – is just not something that can continue. So, today I decided enough was enough. I am writing this blog post, I am going to meet with a friend for coffee (well, decaff) and a chat and then tonight I am going to get back to doing some crafting. Whilst I don’t think that doing these things is instantly going to make everything better, they are the first steps and can only help, not hinder. Below is a picture of some of my many works in progress – I promise to do a blog post soon of at least one of them finished, to give me something to work towards. If you are worried about your own mood or someone that you know or love, there is lots of help out there and I would urge you to use it. In the UK, you can go to your GP and request some help. Anti-depressants are an option, and I have nothing against them, but they are not the only option and if this is not the route you want to go down, then ask to be referred for some psychological therapy. There should be a tiered approach where a range of things can be offered from guided self help to more intensive therapy. In Scotland there is also Breathing Space which is an excellent confidential resource if you are struggling with your mood. Personally, if I can’t lift my mood myself, with a little help from my family, friends and colleagues, then I will be looking into getting some therapeutic help for myself. And there is absolutely no shame in that. Thanks for sharing this Aileen – opening up & talking is the best thing we can do. Love reading others blogs. Love reading yours!! I’m sorry to say that we are in a similar boat. I’m going through a rough patch with my PTSD and it feels like I’m walking thought oatmeal at times. Hang in there and know that I’ve got your back. Thank you for talking about this so eloquently and openly. Happy Monday one and all! While wondering around the interwebs I came across this beautiful post and thought it definitely worth sharing. It is so refreshing to see someone write about their own personal struggle in such an open and unassuming way and it provides such comfort to see in plain black and white that other people may be feeling the same way you are, or have done in the past. Hi, sorry to hear you’re not feeling so good. As you know, help is out there, to be used. Likewise just accepting this is how you’re feeling at the moment also helps. Enough demands are made in life, so treat yourself gently. Baby steps, making things always helps, just enjoy the rhythm of the process..
What a wonderfully forthright post! I’ve just found your blog, and I’m blown away by your honesty and openness here. I’m going to follow the Pingback to “Revisiting Depression” and hope to find that you’re feeling more on top of things these days. Thank you for sharing your own experience and for the details you provide from a professional standpoint. I can’t wait to delve into your blog and read more about your knitting and crochet! In any case, thank you for that post! It really is important to talk about these things and show that it isn’t anything to be ashamed about!